Park rangers often conjure up images of uniformed guardians of historical monuments or natural resources in national forests. In New Orleans, these same uniformed rangers guard one of the United States' most precious resourcesjazz and the music of the American south. The rangers of the New Orleans Jazz National Historical Park are musicians and historians who preserve and promote jazz through performances, education, and compilations of music CDs. 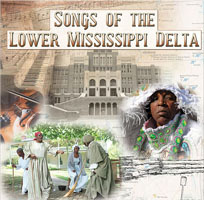 Songs of the Lower Mississippi Delta is a two-disc set produced by National Park Service Rangers' guitarist/banjoist Matt Hampsey and singer Bruce "Sunpie" Barnes, and includes 39 newly recorded tunes representative of the south that made this area the cradle of American music. Blues, jazz, work songs, zydeco, spoken word, poems, spirituals, and period tunes are all represented in this interesting and educational set. An included booklet tells the history of each song and extended liner notes are available on the park service web site. With over thirty musicians appearing on this CD, the talented Hampsey joins in on most tunes, while Barnes also lends his deep voice in song and narration on many selections. He also plays admirable accordion and harmonica on many others and proves himself to be an excellent bluesman on tunes like "Foxhunt." Hampsey and Barnes have chosen their fellow musicians wisely with a great array of talent including beautiful singing by Johnaye Kendrick on "Deep River," and impressive stride piano by Dukes of Dixieland pianist Richard Scott on "Roll On, Mississippi, Roll On." Scott also plays solo on "Bamboula" by New Orleanean Louis Moreau Gottschalk, who many feel wrote a type of proto-jazz in pre-ragtime America. Haunting work songs such as "Rosie" sung a capella clearly illustrate how blues evolved from long hours in the field. Jazz fans often hear how jazz evolved from various forms including blues, ragtime, African drumming, and other ethnic music. Songs of the Lower Mississippi Delta brings together many of those music forms, leaving a clearer understanding of how musical types build upon each other. Listening to these tunes all packaged together makes it clear that music of the early south was important for the development of jazz. As well, each form stands firmly on its own. Succeeding in its effort to educate as well as entertain, this collection will be of interest to music educators and any interested in music history. The National Park Services has clearly guarded this national resource well with this Songs of the Lower Mississippi Delta. Personnel: Bruce Barnes, vocals, accordion, harmonica, cowbell, clave'; Matt Hampsey, guitar, banjo; Alison Leferve, vocal, piano, arranger; Ben Polcer, cornet; Philip Manuel, vocals; Joshua Walker, vocals; Bruce Brackman, clarinet; Chris Mekow; vocals snare drum; Crystal Mercer, voice; Donald Ramsey, bass; Erica Falls, vocals; Ervin "Honey: Banister, vocals, tambourine; Gina Forsyth, vocals, fiddle, guitar; Jason Jurzak, bass; John Jones, drums; Johnaye Kendrick, vocals; Joshua Theriot, vocals, bass; Joshua Walker, vocals; Leroy Etienne, drums, frottoir, backup vocals; Matt Botel, banjo; Michael Harris, bass; Nancy Dawson, monologues, vocals; Nana Akousa Bakeman Gyeaboa, piano, trombone, vocals; Sherrilyn Colby Botel, vocals; Spirit Trickey, voice; Tarik Hassan bass; Addie NiRuma Keys, vocals; Yoruba Kikiloma Mason, vocals; James Witherspoon Sr, vocals, harmonica.